It’s time to wind things down here soon on Ravnica Allegiance review season. I don’t think I need to explain myself too much; you all know what you’re here for, as do I! Let’s boogie on down to the red, green, artifact, and land cards that didn’t pass their guild entrance exam in the new Ravnica Allegiance! It would be easy to dismiss Amplifire, but this card actually intrigues me. It’s controlled chaos. Decks that like to set up their future draws with some scry effects or Sensei’s Divining Top-style cards might be able to take advantage of this weird ability. Straightforward creature decks like Xenagos, God of Revels might also be able to utilize this effect more potently, digging down to one of their many powerful creatures and powering up for a huge Chandra’s Ignition. Balancing your Oracle of Mul Dayas and Ignition Teams against big creatures to get a consistent payoff won’t be easy, though. The card also still lacks evasion, so it’ll get chumped all day. It’s an interesting card but I don’t know if it’s going to get much play. It could do some work, but it will take some work. DM Cross and his fellow Krenko, Mob Boss players all got a combined feeling in the happy place in their hearts when this ditty was spoiled. Sometimes it won’t matter if the defending player has enough blockers, they’re just going to die to the triggers anyway. At only two mana, it’s not even much of a hassle to drop Cavalcade down once you’ve set up a decent board presence. Just imagine staring at the Goblins player while they untap, cast Cavalcade of Calamity and Raid Bombardment, then proceed to attack and deal tons of damage before they even make contact. Combine with Shared Animosity or Purphoros, God of the Forge to pump up your creatures after the Cavalcade has already triggered. This’ll put in a surprising amount of damage for the players wily enough to abuse it. A better-ish Shatter effect? Maybe. If your buddy plays Arcades, the Strategist then this is sure to pants them a couple times, but Ravnica sets have already given us Shattering Spree and Vandalblast for more reliable artifact hate, and we can just burn down creatures in red with other damage effects already. Well, well, well. What have we here? A burn spell that wants to imitate the free-spell effects of the Expertise cycle from Aether Revolt. I really like this card. Spellslinger decks that need efficient enablers are sure to love this card too. There is likely going to be stiff competition to run it, as X-spells that only hit one target aren’t the greatest; Comet Storm has one-upped that space already. Still, the upside to get a free spell out of it should convince some people to play it. If you combine it with some Urza’s Saga era cards that untap your lands (Frantic Search and the like) this card could get dirty. Mizzix of the Izmagnus should be pleased, and folks may even consider playing it as a combat trick to remove someone’s blocker and drop an unexpected Coat of Arms into play! Folks with five-color Guildgate decks will likely include this. This can deal up to 11 damage to all creatures for only three mana, a fantastic rate… though Blasphemous Act can still do better, and do so more consistently. It’s interesting, and thematic, and that’s probably reason enough to run it in fun alternate-win-condition decks, but don’t forgo the staples that help make your deck work, too. I want to like this card, but Harsh Mentor has been around for a few years and only has made it into 2,365 decks. Some punisher-style black/red decks might combine these two with Painful Quandary to achieve maximum pain levels, and while that won’t be fun for a lot of us at the table, it will be very fun for the person helming that deck. One of the more “EDH-y” cards of the set. Coin flips, making copies of creatures, and a big ol’ mana cost is what Commander is for right? Flameshadow Conjuring is starting to get a little more play lately thanks to Brudiclad, Telchor Engineer, and the upside is much higher on Mirror Match. Seems like the card that could secretly get into 5,000 decks without people noticing just because it’s fun and does splashy things. Neat way to get extra ETB effects, too. I’m really only mentioning this because it’s a 1-mana dork for Rakdos, Lord of Riots decks and I love those types of decks. “Each player,” effects are terribly underrated and this one is a terribly cheap investment. This card does everything Doubling Season wants its creatures to do: make tokens and put counters on them. I have to believe this is the Ooze lord MaRo’s hinted at over the years. The fact that it buffs itself up in addition to the tokens it makes is pretty neat. If you want all the flavor, toss this in your Experiment Kraj deck for some nifty effects. The card doesn’t stand on its own quite the same way Tendershoot Dryad does, but it becomes a much better beater head-to-head than the Dryad. Either way, you can play Biogenic Ooze and then wiggle the card at folks saying “It’s alliiiiiiive,” like a weirdo. Points for that. I am very surprised this card doesn’t have a Gruul watermark on it, just because of the awesome Boar (we can’t wait for the Gruul Boar God, WotC!) but regardless of watermark, this is a great budget Craterhoof Behemoth. Like Decimator of the Provinces before it, this card will help round out any go-wide type deck. Don’t discount the vigilance; that ability is already underrated in Commander, and it may be overlooked here too, but it shouldn’t be. Keeping that army up for defense is very important, so even if this isn’t as big a blowout as ol’ Craterhoof, it has a lot of merit and definitely warrants play. Either WotC forgot Commander is a thing, or they definitely remembered Commander is a thing! For everyone except Shadowborn Apostle/Rat Colony/Relentless Rats/Persistent Petitioners players, this bad boy will draw you a card whenever basically any nontoken creature hits your battlefield, and green loves creatures. It’s not even a cast-specific trigger, so you Roon of the Hidden Realm can blink happily away! The fact that it’s a hard-to-kill enchantment is just gravy. Soul of the Harvest is played in almost 12,000 decks and costs two more mana, so I have to imagine this card is going to find its way into quite a few decks. I’m not completely sold on this card. An instant speed Restock effect for permanents is certainly powerful, but five is quite a bit of mana to keep up in a green deck. Besides, Restock itself barely sees play in 1,100 decks. If it were a true instant-double-Regrowth, rather than an instant-double-Nature’s Spiral, I would like it much more. The internet went wild when it saw this card, but my immediate impression wasn’t as charitable. Still, I regained control of my knee-jerk reactions, and after some time, came back to re-evaluate it. However, I still haven’t reached the heights of praise others have reached for this card. Wilderness Reclamation can certainly be a powerful effect, but it requires building around to make it especially powerful. We’ve gotten to the point we we actually have to build our own Prophet of Kruphix using Seedborn Muse and Leyline of Anticipation effects, which definitely showcases how nutty the Prophet is. Wildnerness Relcamation can be another tool in your Build-a-Prophet workshop. If, however, you aren’t specifically using effects to take advantage of this, untapping your lands might not do much; it might be wiser to hold back a few spells and keep up three mana for Beast Within instead of running out your entire hand and then using this enchantment to help you cast Beast Within. Plus, this card doesn’t help much in the early, developing stages of the game. All in all, if you build around it, it will do work, but if not, you could very well be better off with another ramp spell. A two-mana anthem is nothing to sneeze at. The problem? It’s way narrow. At least the Liege cycle from Lorwyn (such as Creakwood Liege) worked on creatures of both colors. This doesn’t seem worth the slot unless your deck is naturally churning out a high number of multicolor creatures. That’s a tall order, since anthem effects generally like to appear in go-wide token decks, and the majority of token-making cards create monocolored tokens. There are some decks that this will naturally fit in very well and be a cheap effect, but many where this will be a dud that doesn’t do enough. Build your deck wisely. Pretty much anything I said about Glass of the Guildpact applies here; if you build your deck around the card, it’s going to be good. If not, it’s going to be very bad. This has way more potential to be on the bad end because it’s more than twice the mana investment than Glass of the Guildpact, and a five-mana ramp effect is a lousy, lousy topdeck. Ramos, Dragon Engine players, please feel free to come back to this review in three months and tell me how wrong I am because the Tome drew you six cards in one turn. Everyone else, this will probably be a five-mana Commander’s Sphere. 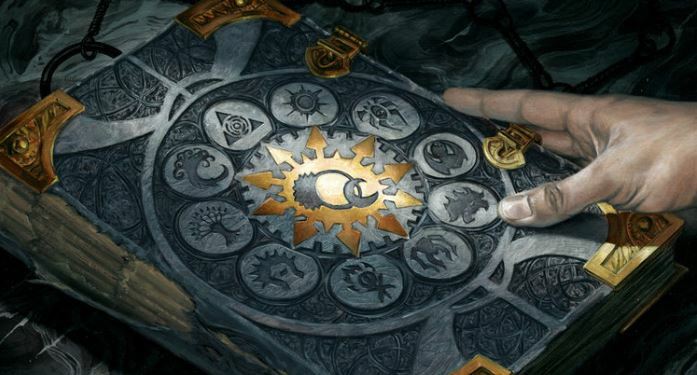 Azorius Locket, Gruul Locket, Orzhov Locket, Rakdos Locket and Simic Locket, like their predecessors, should all see much more play that they’ll actually get. I have been very pleasantly surprised with how well the Lockets work, especially compared to the Keyrunes and Cluestones before them. This cycle has probably moved to my second choice for colored mana rocks in a two-color deck. The times you need the cards, you probably won’t mind the four mana it requires, because cashing in for two cards is a whole lot better than cashing in for just one. Nothing new here, but historically, people aren’t ramping as much as they should, and if you’re playing a two-color combination, especially nongreen, there is little reason not to play them. Five-color Gates? Five-color Gates! ‘Nuff said. There we have it! We’ve made it through another review season! Did we miss any of your favorite cards coming out in the new set? What are some of your favorite cards you’ll be keeping an eye on for your own decks? Be sure to check out the week’s previous reviews for each guild, and let us know your favorite cards from Ravnica Allengiance in the comments!